» What’s next for the St. Francis? What’s next for the St. Francis? The St. Francis, at the corner of First and Ferry in downtown Albany. The building is in “fair to good condition for its age,” the consultants say. But fixing it up for new uses would not be cheap. Rough estimates by Greenberry Construction put the cost at upward of $10 million. From Councilman Ray Kopczynski: You may recall that CARA/ARA had the opportunity to “do something” with it a couple of years ago. I came out on the very short end of that vote and it was left as you currently see it. By now, it could have been up & fully functioning along the lines of what ostensibly is being proposed – although I haven’t seen the consultant material yet. It will be interesting reading and discussion! 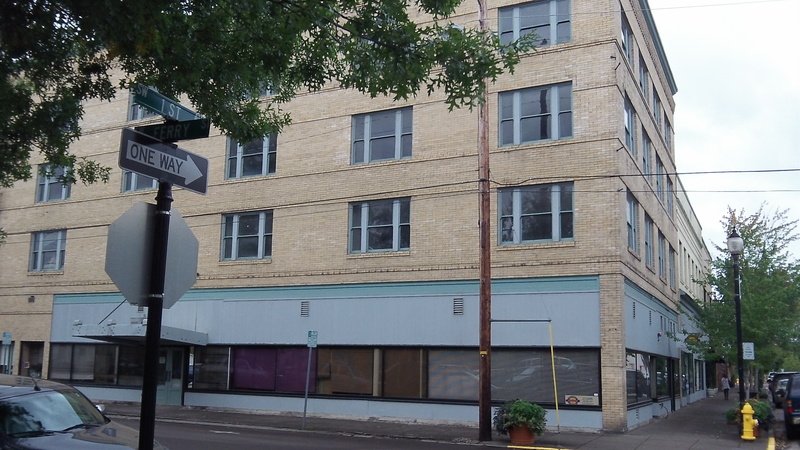 Jim Clausen, on Facebook: Yup, that’s what Albany needs, another vacant building CARA can claim as it’s own… These multipurpose (commercial suites below – housing above) have been tried a throughout Oregon and have failed miserably. Salem has 3 (yes 3) of these types of units and the are virtually vacant (‘cept for the units rented by Salem). These types of units are pushed by these corporate entities (especially the LEEDS approved) as viable “investments.” I have yet to see one that has actually panned out as planned. CARA is looking to waste more tax dollars, and it probably will do just that. From Tom Cordier: Please recall that Measure 22-119 (requiring an election to authorize certain city borrowing – ed.) passed by an 80% yes vote. The message sent is that voters do not like the spending habits of the political class in Albany. City Hall to the old hotel is ground zero for past CARA spending. Voting precinct 003 voted in favor of 22-119 but only by 53% and precinct 001 voted in favor but by only 62%. The farther away from that core area the higher the yes vote %. There are eight precincts with 80-84%yes votes and 9 precincts with 85-89% yes votes. Have the seven appointed CARA members and seven elected CARA members failed to understand the will of the people? They should recognize people outside the CARA core have other priorities than propping-up an old hotel. We could have been under-levying CARA siphoning and preparing for the expense of new police/fire buildings. The current push for $20+M bond is a failure in setting priorities. To continue to prop-up the core areas around city hall continues to displace fundamental governmental responsibilities. Jim Clausen, on Facebook: Hasso, on his blog site, has a tendency to comment on almost all of my replies. To this one he commented, “Good ol’ Jim. Always looking on the bright side. (hh)” It is a typical liberal tactic to attempt to diminish any contrary views or opinions by ridicule and without any proposed facts. Going liberal on us Hasso?